Amerks Scare the Monsters In Cleveland · Let's Go Amerks! 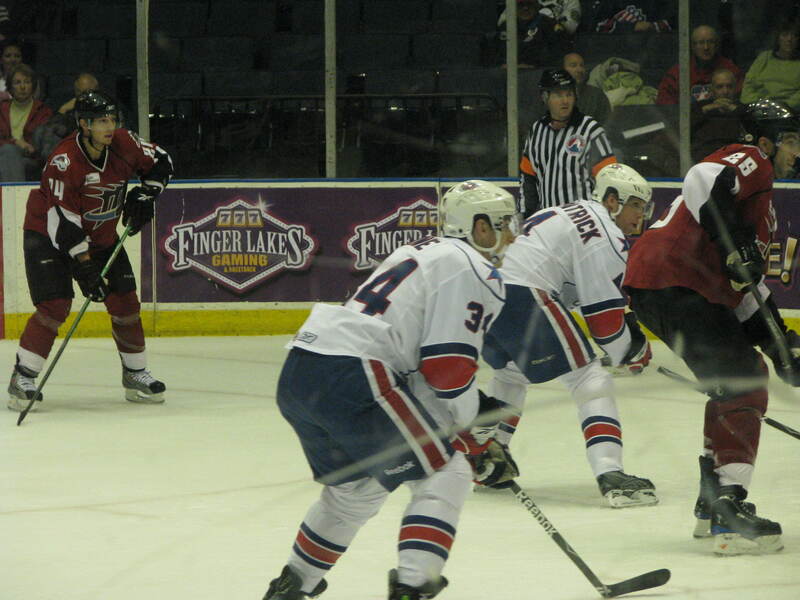 Only 13 seconds into the game, Stefan Meyer took on Nathan Smith of the Lake Erie Monsters. Mike Caruso just gave the puck away right next to the net. Lucky, Brodeur was ready and stopped the puck before anything bad could happen. A breakaway was stopped by Keaton Ellerby…but, he also got called for hooking. Nice job by McArdle, followed his man stride for stride and stole the puck to send it down the ice. David Brine is showing a great forecheck on the penalty kill. Brodeur was way too far out of the net, which allowed Mike Vernace behind the net to pass to Chris Durn, who was skating in untouched and easily put it into an open net. Second period, more of the same.. Amerks take it.. spin it off the boards behind the net and unable to set a play up to take a quality shot. Or, bring it in and take a shot.. it bounces off an opposing player and they bring it back for a two on two. Amerks finally get a bounce.. Larman took a shot and everyone was heading to the front of the net, it trickled past Monster’s goaltender, Jason acashihua, and Mike Duco slipped in behind the goalie and put it in at 11:30 of the 2nd period. Mike Duco and Mark McCutcheon dropped the gloves, Duco got a few great upper cuts in. Best part about it was the Lake Erie feed showing things such as biff, kapow, boink – like an old Batman show. Peter Aston kept the puck in three times on a great effort by the Amerks. They kept the puck in for about a minute straight. 1:48 left in the second, great shot by Sprukts. McArdle almost had the rebound but, the Monsters were a little too quick. Kiss Cam came around to the the bench, as it always does…Keaton Ellerby and Jordan Henry were shown. Keaton gave Jordan a knowing glance and a little smirk. No kiss came from it. Too bad I guess. Killed off a 5-3, followed by 5-4 for another minute that they were able to kill off… great penalty killing by Sprukts and Aston in clearing the puck. Amerks going on a PP after Garrison was hauled down by the Monsters as he split the defense. Meyer Sprukts Micflikier Duco and Garrison on the power play. Micflikier scores his 2nd of the season at 7:52 of the 3rd assisted by Garrison and Sprukts. 8:59 of the third the Amerks have another power play opportunity.. same PP line on the ice which is working out well putting Sprukts on the point with Garrison. The team actually seems to be using a system tonight as they’ve had some puck movement on the power play. David Brine awesome wrist shot puts the Amerks up 3-1 at 11:05 of the third period and his 2nd of the season. Assisted by Welch and McCardle but it was all Brine. He held the puck for a good two seconds before releasing the shot. After staying out of the penalty box for most of the game the Monsters have given the Amerks their third power play of the third period. They seem to be losing their cool and getting frustrated at losing against the Amerks again. Another penalty by the Monsters is giving the Amerks a 5-3 advantage for a full two minutes. Mueler was trying to skate past Sprukts for a short handed breakaway attempt but while doing so he pulled down Sprukts. Kenndal McArdle blocked a shot in the final seconds with his ankle. He seems to be favoring it a bit. But, he is putting pressure on it. The Amerks didn’t look tired tonight and they didn’t take for granted that they have already beat the Monsters this season. Come down and watch the Amerks take on the depleted Syracuse Crunch. The game starts at 6:05 pm.